Have you ever been in one of those seasons of life where things start to pile up, one right after the other? When it rains it pours, right? Whether it's financially, medically, time-wise, strain on relationships, or something else, these things are easy to take life from good to bad very quickly. When I think of these seasons, I think of two specifically for our family. The first one happened right after my second daughter was born in 2013. It seems like as soon as that child was born, our family took a downward spiral health-wise, and didn't come back up for air for months. It was awful. 3/4 of us (thankfully not the newborn) got a terrible stomach virus which landed me in the hospital for fluids when the baby was 3 weeks old, I got recurring UTIs for months, my older daughter dislocated her elbow, the baby got pink eye, my husband sprained his wrist, I had an awful case of mastitis when the baby was a week old, found out my older daughter had a peanut allergy, had a several month long issue with nursing where lactation consultants thought I had thrush (turns out I didn't, but it was being treated as such for months). We lived at doctor's offices. And this was on top of normal colds and well child checks, post partum checks, chiropractic visits, etc. I seriously thought it was never going to end and we would never be healthy again! Then one day it was like "Oh! No one has been to the doctor in awhile! Yay!" The second time was more recent, after we moved into our new house. All at once, we had an awful problem with our bank which pushed our mortgage back and caused us to need to switch banks, which also meant we were "renting" our house until it all went through which we didn't budget for. We had to deal with permits, inspections and work for getting our basement done (i.e. different random men in our house every single day trying to explain things to me that I was supposed to relay to my husband, but didn't understand...). I had an oral surgery that didn't go as well as planned and on that same day my husband was in a car accident and his car was totaled. Somehow he got the worst insurance agent ever from the other guy's insurance, who literally took 6+ weeks to figure anything out, even though it was not my husband's fault and the police report and witnesses said so. So during that time we were sharing a car, which wasn't terrible, but not ideal. Multiple calls to insurance every day was what was more tiring. Calling for bids for electric, plumbing, HVAC, drywall finishing, etc. on the basement. Trying to figure out if we were ever going to get a driveway or landscaping. Plus my husband being in class two nights a week and working a regular job, leading a church planet, and oh yeah, taking care of our kids and trying to get settled into our new house. It was a really stressful time that again, I thought would never end. There was problem after problem and just when we thought something would work out, something else went wrong, like when we found out that couches won't fit into the basement because of the odd layout (yeah, that was fun). We are through most of those things now, with some of them just getting finished up, so I can see the light at the end of the tunnel now. I like to think that I am pretty good at handling stress, but times like these where there is just so much are really hard, for probably anyone. It is easy to just feel defeated and want to wave your white flag and give up! Don't give up! I know you can't give up in the sense of handing life...you can't just give up on being sick, it just happens. But I think we often give up in the sense of apathy, and just struggling to go on with life and everyday tasks, relationships, etc. First, take a deep breath, pray about it, give that burden to the Lord. I'm not going to tell you to just let it go and don't worry about it, because we all know that is way easier said than done. When your life is in shambles it is nearly impossible to just "not worry about it". God wants to hear the cries of your hearts. He wants to take care of you. He carried your burdens on the Cross, and nothing that you are going through is without Him. He is gentle and humble in spirit. Yes, He is! So often I am finding ways to "fix" my problems, or lessen my anxieties or just make my life easier/better/happier, etc. So often I am leaning on myself and my ways to do that. I need less of me and more of Him. Not only in the times when everything is going wrong, but every single day. Less of me. Less of me. Less of me. The load He gives us to carry is light. He took it all on the cross for us. For you. He's not going to leave us alone now! Not when we are going through sickness after sickness, or dealing with insurance and house people and bank problems. Of course none of these are huge problems in the grand scheme of life and eternity, but the do add up, don't they?! Give it to Him, friend. 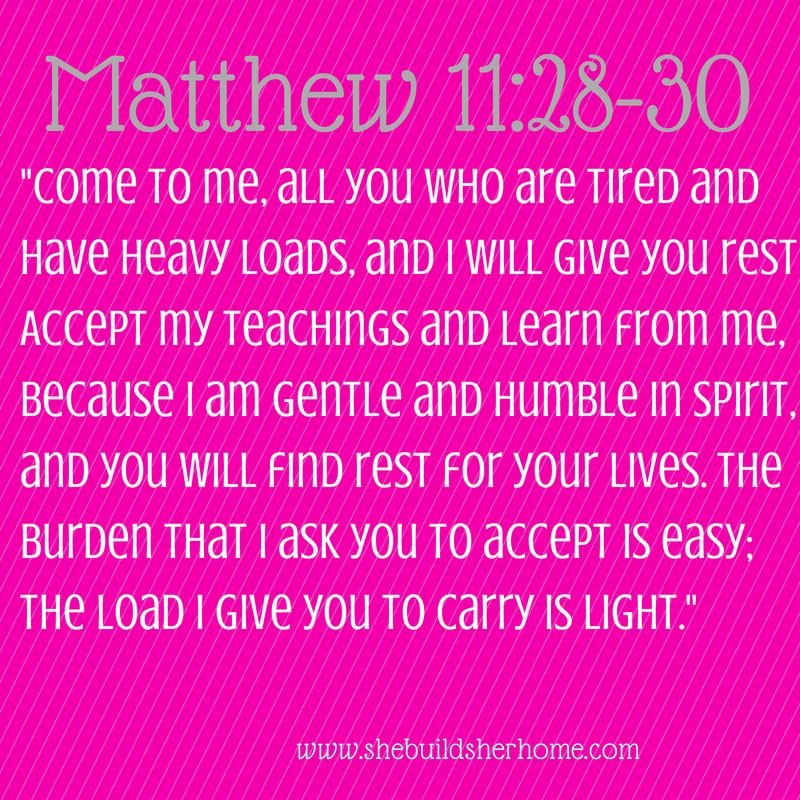 Let Him carry your load so you can rest easy tonight. Go to Him and learn from Him. Accept His grace in your life. It doesn't feel light today but I know it will pass :) Struggling times are so hard.